Two murdering thieves (Haig and Arquette) hear a sound as they rob the corpses of their victims. Going off to investigate, they end up crossing into the sacred ground of a tribe of cannibalistic Troglodytes…the kind that the civilized tribes won’t even go near. One of the two survive long enough to get to the town of Sheriff Hunt (Russell), only to be shot and taken in for questioning. When the town’s doctor is too drunk for surgical repairs, Mrs. Samantha O’Dwyer (Simmons) is called in to take his place. The tribe comes into town, takes the thief, the deputy (Jonigkeit) and Samantha back with them. Sam leaves behind a husband (Wilson) who is recovering from a broken leg. This does not keep him from being the first on a horse to go with Sheriff Hunt in the quest to rescue the abducted. Town dunce and assistant deputy (Jenkins) and local gunfighter John Brooder (Fox) also join into the doomed crusade. It goes downhill from the start. The running horses eventually walk and then are absconded. Soon enough, the party is on foot. Mr. Dwyer’s condition is deteriorating and eventually he is left after having his leg set once more. The troglodytes are just waiting for them, but Sheriff Hunt is obliged and he trudges on. 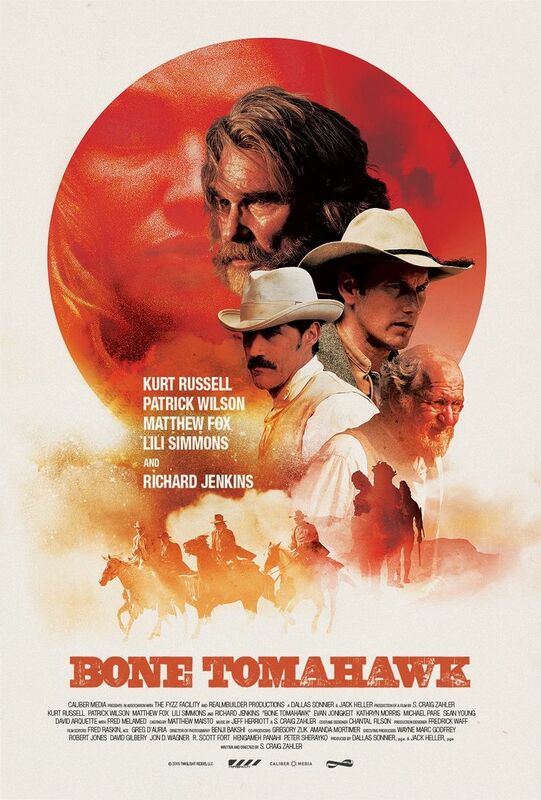 Bone Tomahawk is a deceptively intelligent story with one foot set in grim reality and another set in blind faith. Russell is an actor that does not work nearly enough, for my tastes. This performance falls somewhere between his career best as MacReady in The Thing and Wyatt Earp in Tombstone. His Hunt is in complete control within his own environment, but as he moves further from his base, he becomes less assured, if no less determined. The tweaks that Russell applies to his character ride the line between confidence and fear. Russell’s interplay with his assistant deputy played against type by Jenkins shows this line as clearly as anything. Jenkins is dim, but sturdy. He takes everything he’s told by the Sheriff as Gospel, but his memory and feedback reflects the changes in his boss like a mirror on Hunt’s soul. If it’s hard to necessarily believe Jenkins could ever be as dim as he appears, but his performance is so steady, the rest of the story benefits. As the assured, bigoted and strangely honorable Brooder, Fox gives a performance that is more than it would appear. There is a subtle power that is not present in your usual white hat / black heart role that we see in a western. His strength is implied as pomposity at first, but soon enough, we discover that he has the strength to follow through on his word. This is a good role for Fox, who I have barely seen since LOST. He deserves more substantial work, and hopefully this will allow more to come his way. I think I will give Extinction a look for now. Good as these performances all are, the film does not belong to any of these actors. This is the story of Arthur and Samantha O’Dwyer. Their struggle to maintain their marriage in the harsh western landscape would be hard enough, but the differences between men and women when it comes to wounded pride gives it a different spin. This is why frontier life is so difficult. Not because of the Indians or the elements, but because of the idiots. Samantha loves her husband and is completely grounded. She has no pretense and just wants to connect with the part of him that reaches out her in rare moments of honesty. Arthur has wounded pride and a feeling of helplessness. This feeling compounds once his wife is taken from him. But he does not let it deter him from moving towards the chance of rescuing her from a seemingly doomed fate. We see that even if he has a certain bluster, he still is a practicing Catholic who by faith, by rote or both, continues to hold hope that God will allow him to intervene in some way. This angle is an unusual and very satisfying aspect to Zahler’s story. It takes a strong storyteller to throw belief in the midst of any story these days as anything other than a gimmick or a sign of weakness. Wilson’s character starts off in weakness, but we realize as he is left as an afterthought, he shouldn’t be forgotten. He has a resilience and faith, somewhat like Samwise Gamgee, to keep pushing, unnoticed and underestimated. Wilson is one of the few actors that can at once seem at once intelligent and daft, wounded and dangerous. The best performance is easily that of Lili Simmons. She loves her husband, even if she knows that he is as foolish as the other men that surround her. She experiences the terror, but keeps a clear mind. Seeing her work with her other captors is a thing of beauty. Never letting the fear getting in the way of her love for her husband, she is a steady presence in the film’s last act. It’s due to her performance and complete grasp of the character as written by Zahler that we do not at any point see her as a victim, but as someone who is formidable for what she knows and how she can control her fear. I know we will see more of her in the future. Zahler has a knack for developing characters and a delightful command of the English language. There are so many wonderful lines in the film, it feels like watching a book. The story takes forever to give the viewer any sense of hope, which is a brave choice for someone with such relatively meagre experience in the business. He should be given more resources to see what he can do. The only real blemish in the film is the performance of Sean Young as the mayor’s wife. Her lines, as few as she has, are so poorly delivered it completely takes one out of the experience. I never rooted for her career to tank like it did in the early 90’s, but whatever she’s been doing since then, it doesn’t seem to have been acting. If you like horror, westerns or both, don’t let this film go unnoticed.